Sometimes there is just so much music happening on the same night it’s difficult to decide where to go. But you can’t beat the one-two punch happening at the High Noon Saloon and at the Barrymore Theater. Hot off the press is the excellent new DVD by the Clyde Stubblefield All Star Band. A more detailed review will follow but suffice it so say that this performance captured on September 11, 2015 is one for the Madison ages. 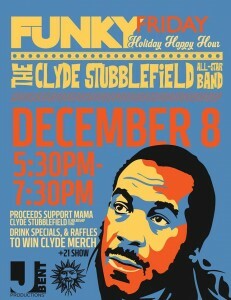 The all-star band is joined by all-star guests to pay homage to Clyde Stubblefield and to launch the MAMA Clyde Stubblefield Scholarship Fund. The following night the band would be joined by members of the James Brown Band for an official tribute at the Overture Center. There are limited numbers of this special DVD/CD package and you’ll want to get your hands on one to savor some of the last performances by Clyde, Snuffy Smith and Charlie Brooks all who have sadly passed. You can score yours at the Funky Friday December 8th and, if you’re lucky, there may be some left for the next in the performance series on February 2nd. This is an early show: 5:30 to 7:30. 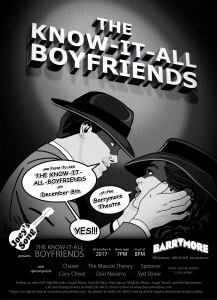 You can hustle on over to the Barrymore immediately after to catch the annual Joey’s Song benefit, another star-studded affair featuring the Know-It-All Boyfriends and their very special guests. This is always a rip-roaring affair and brings together Butch Vig, Doug Erikson, Freedy Johnson, Jay Moran and more. There are some unannounced appearances that you won’t want to miss. Also appearing on this bill are Dan Navarro, Syd Straw, Cory Chisel and Mascot Theory. If that’s not enough there are reunion sets by two of Madison’s greatest bands, Chaser and Spooner. Whoa! Showtime is 8pm. Just a smattering. Holy crap, check your trusty Isthmus Calendar for full listings area-wide.